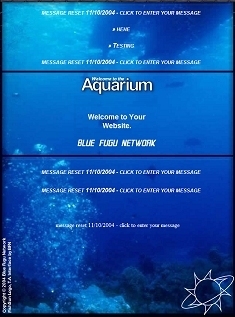 Click on a fish above to learn about the The Aquarium's Self-Edit Technology. If you miss the fish, click Home to try again! click on the download link at the top of the page. Access your messages from anywhere. Featuring a one page website, with no coding required. Self-Edit or Click-To-Edit interfaces make it easy for you to edit pages online. 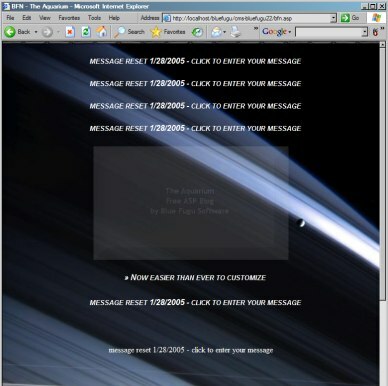 This is an ASP open-source product that relies on the power of Microsoft Windows XP Professional and your broadband connection for world-wide communication. Note: This software may not run on the latest PCs, or Windows Vista. Click here for info on database permissions for your PC when setting up security for the database.